Clearly, we cannot consider the increase in circulation as the cause for those increases. The only other notable event was… well the German invasion. 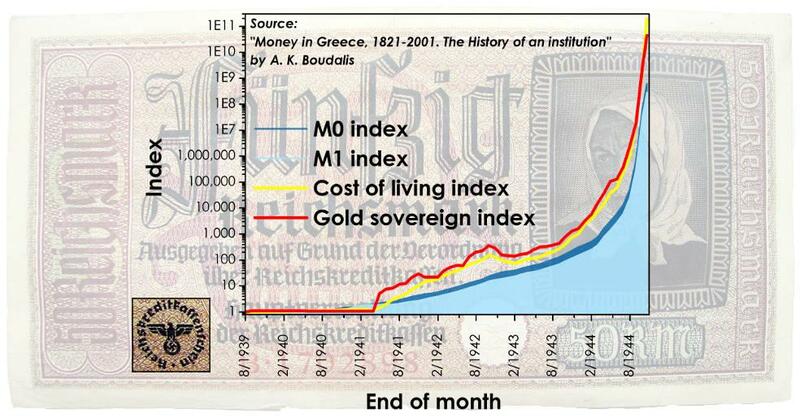 We can briefly say that Greeks, fearing the foreign occupation, hoarded goods. Foodstuffs were taken away from the market under the fear of shortages and gold, which was considered a stable value was demanded in payments. With the markets drained of goods and with gold infiltrating in exchanges, the demand for drachmas collapsed and its value went along with it. The “flight from the drachma” began. This view is also supported by the efforts of Hermann Neubacher, special economic plenipotentiary of the Reich in Greece, to prop up the drachma by gold sales at the Athens stock exchange (ca. 1.3 million gold sovereigns after November ’43). This tactic reveals the importance that the occupation forces ascribed to the purchasing power of the drachma, because it directly determined the seignorage they could derive from fresh printings. They didn’t care about the health of the Greek economy, but they aimed to keep the cow alive just a little bit longer so that they could keep milking it.